The Reference Frame is the only well-known website in this Solar System that defends supersymmetry as the most likely next experimental discovery in high-energy physics. Others in the "public sector" apparently have no clue. He puts the increasingly likely observation of SUSY into the context of the early 1980s when people like him got excited by physics during lectures by Stephen Hawking et al. Gibbs was pretty much trained to respect SUSY; I wasn't. As an undergrad in Prague, I was brought up to believe that SUSY was stupid. All my positive attitudes to these state-of-the-art theories, including string theory itself, were always partially a matter of revolt against the establishment (although such a revolt was never among my main goals). Of course, the "official" opinion of my environment changed when I came to Rutgers in 1997. Pilsen is one of those proper cities that have a well-defined center, namely the St Bartholomew Cathedral, a church with the highest tower in Central Europe (103 meters), which stands in the middle of the Square of the Republic (129 x 192 meters). What is it? An answer will be found below. Click to zoom in. There hasn't been a fountain on this rather large square since 1890. However, the city hall has organized a contest. It had its winner who has solved the task most accurately and the results are three new fountains in the corners that were activated two hours ago during an interesting happening. A very large fraction of the respectable names of the climate science that you know - Richard Lindzen, Roy Spencer, Fred Singer, Henrik Svensmark, Willie Soon, Will Happer, Bob Carter, Craig Idso, Paul Reiter but also folks such as Lord Christopher Monckton, Joanne Nova, Anthony Watts, or your humble correspondent, among many and many others - have helped Aeris Systems - a truly professional and well-educated firm - to build the state-of-the-art application that explains and studies the science of climate change. Click the tree logo at the very top to get to the Apple home page of the app or remember the ourclimate.info URL (old). AppShopper has a page, too. To actually buy the app, you need an Apple ID. When you have it, run your iTunes, search for Our Climate in the right upper corner, filter by apps, and you will see the tree logo once again. 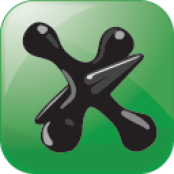 The result is a fantastic application sold for USD 0.99 (or EUR 0.79) whose real value is hundreds of dollars. I have often confused Newton and Witten - a silly Freudian slip. Once he got his Newton Medal, there's a new reason for such a confusion. Below, you will find the video from his one-hour lecture. Reuters and dozens of other sources promote the craziness of the day, namely a bunch of statements by a Michael Oppenheimer of New Jersey and his pals, Shuaizhang Feng and Alan B. Krueger. The paper was edited by the late Stephen Schneider a month ago. He and his friends essentially claim that global warming is going to be the main reason of the Mexican illegal immigration. Between 1.4 and 6.7 million Mexicans will arrive to the U.S. by 2080 because their agriculture will get worse, and so on. Of course, this statement is completely preposterous but the media make it even worse when they exclusively quote the upper "6.7 million" figure in the title. Originally posted on July 19th. Watch live at 5:00 pm local time (Tevatron Higgs). 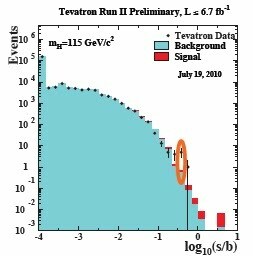 As announced in Ben Kilminster's talk between 5:00 and 5:30 pm (see video on demand, go to 2/3 of the sliding bar, or PDF of presentation), the Fermilab has excluded the 158-175 GeV range for the Higgs mass, safely surrounding and choking Alain Connes' unlucky noncommutative geometry "prediction" of 170 GeV. The Tevatron has also independently begun to exclude the extra-light Higgs region, below 110 GeV or so. Also, Kilminister has pretty much confirmed and demystified both rumors we recently publicized. Five tantalizing candidate "b-bbar" events for a light 113-115 GeV Higgs boson were seen, in a bin with some high values of signal-over-background ("s/b" on the graph's x-axis, depicted on a log scale) where only 0.8 events would be expected from a Higgsless background! This fact at least softly confirms the first Higgs rumor. If the signal is real, it has to be a non-Standard-Model (e.g. supersymmetric!) Higgs because of the absence of signals in other bins. See the most Higgs-like jet-jet 113 GeV event on page 67/79 here; it's not too sharply incompatible with the LEP bound. (You should never trust the exclusions at the end points - do you remember Feynman's popular book and the story on the V-A weak interactions?) See also What a light Higgs would mean for particle physics. Five Higgses at the Tevatron. Click to zoom in. Another cool 113-GeV Higgs-like doubly b-tagged dimuon event. Quite possibly a ZH event. Based on 2/fb only: can grow and confirm the second rumor. Click to zoom in. The Internet staff in Paris was not up to their job because the live broadcast was largely unusable - overloaded connections were the excuse. That's why I only reported a part of the MSSM results several hours after the talk. So as I have just said, there also exists a mostly CDF weak evidence supporting a heavier neutral CP-even Higgs boson near 140 GeV. Your humble correspondent personally thinks that the existence of both Higgses, below 115 GeV and near 140 GeV, is actually the most likely outcome. See Why God particles have five faces in supersymmetric worlds (like ours?). one of the Internet's first personal, regularly updated sources dedicated to exact sciences that provided the readers with a specific mixture of insightful and playful perspectives on recreational - and sometimes even serious - mathematics on one side and crackpot speculations about the physics beyond the Standard Model (and sometimes even similar quality "insights" about the physics of the Standard Model) on the other side. However, he decided to transform himself into a climate scientist overnight. As his diary reveals, his university will be paying him two years of life in Singapore where he will be doing something that he has clearly no clue about. Many French people know their president, Nicolas Sarkozy, as a savior. By the way, ex-PM Topolánek is no gypsy who has never seen meat but he surely loves to dance with the gypsies. On Monday, when D0 and CDF will present their combined data at ICHEP 2010 in Paris - which could bring hints of a beyond-the-Standard-Model Higgs sector -, Sarko decided to attend the conference. Just like during an Irish-French soccer match, Sarkozy will demand a VIP box from the organizers. The official Élysée Palace website calls the visit an "intervention" but yes, Google Translate translates it as a speech. ;-) The speech begins at noon. A good timing, Mr President. ;-) Ben Kilminster, a rock band front man, will present the combined Tevatron results at 4:40-5:10 pm. Anthony Watts writes about some explosive yet amusing developments at scienceblogs.com, a blogging platform masterminded by the Seed Magazine - more precisely Seed Media Group because the magazine has been defunct for a year or so. They recently wanted to add a new blog on nutrition, Food Frontiers (now on Pepsi websites), sponsored by PepsiCo: please feel free to buy two dozens of bottles or anything else from the amazon.com link. The idea makes a lot of sense because Pepsi knows quite a lot about these matters and it is also doing a very good job in practice - as its successful market battles against CocaCola have demonstrated. They not only produce some tasty products - beverages and food - but also know how to package it in an efficient and environmentally friendly way, among other things. There was no problem with transparency, either. The first article on Food Frontiers mentioned that it was an extension of their corporate blog, the authors were PepsiCo employees, and that it was "presented by PepsiCo". An absolutely flawless setup. However, the Seed Magazine happened to forget that their blogging platform has been built upon a time bomb. The magazine has filled their server with dozens of unhinged activists who pretend to be interested in science but whose real passion is radical left-wing politics. Experimental hints suggest that the Higgs boson is almost certainly lighter than 200 GeV and very likely to be lighter than 160 GeV if not 130 GeV: its mass isn't too much larger than the mass of the W and Z bosons which are close to 80 and 90 GeV, respectively. In What a light Higgs would mean for particle physics, I also explained the theoretical reasons why the Higgs can't be heavier than 800-1,000 GeV. At those values, the quartic self-interaction would be very strong and would be running even stronger very quickly, eventually falling into the "Landau pole" trap of a divergent interaction that probably makes the theory inconsistent as a separate theory (and surely useless in its perturbative form). In the previous text, I explained that gauge coupling unification represents a tantalizing piece of evidence that Nature respects supersymmetry. In these two colliding clumps of matter, dark matter apparently got separated from the visible matter, as reconstructed from their gravitational effects. That's a modern observation supporting the dark matter paradigm. How much dark matter is there in the Universe? Sadly, one day after he jumped the shark, Stephen Schneider used a flying carbon-burning killing machine and before he landed in London, he died of a heart attack caused by complications induced by a rare type of cancer. The world is losing a passionate champion of the causes he genuinely believed in, including an imminent ice age and catastrophic global warming. Many of his worries were based on sophisticated models of global warming (see the amazon.com link below). So far, this PNAS paper remained the only visible result of a bigger project that Schneider, Ehrlich, Falkowski, and others invented - a self-described outlandishly aggressively partisan campaign against the climate skeptics. Rest in peace, Prof Schneider. Is EU preparing jails for climate realists? In this audio, Nick Griffin, the chairman of the U.K. nationalist BNP party, claims that the EU Parliament is planning to add Europe to "The International Environmental Law Court" (is it this one?) that may also try to punish climate realists for their being realists. When Griffin asked whether the court would also go after climate skeptics, he didn't get a straight answer. But after some time, the answer was essentially Yes. Last time TRF dedicated an article to the plans for the International Linear Collider (ILC), it was 2006 and the beast was supposed to be built in Illinois. However, America has weakened since 2006. So The Independent, a British communist daily, brings us fresh news that it's more likely that the ILC will be built at CERN, too. The construction could begin in 2012 and last for 7 years. A 31-kilometer long tunnel would be 10 times longer than its older brother, a 3.2-kilometer long tunnel at SLAC, California, built in 1962. The notion of emergence remains one of the intellectual symbols of the ultimate snobs. People who claim to believe in emergence think that they are very cool, progressive, open-minded, and creative thinkers who promote supermodern scientific methods that were unknown to the old, dull scientists. In reality, emergence has been the bread and butter of science for centuries, long before the term was explicitly used. Whenever scientists succeeded in reducing a more complex phenomenon, CP, into some more microscopic laws, ML, they showed how reductionism works in practice. The main difference between reductionism and the emergent philosophy is that the reductionists consider ML important whenever it is used to derive CP while emergentism views such a derivation as a reason to spit on ML because the derivations and the understanding is not what they are really after. If you have 117 spare minutes, I recommend you to watch a 1984 Polish cult science-fiction movie, Sexmission (with English subtitles), which is arguably the best Polish comedy ever. I don't fully understand what's happening on the video above - explanations welcome - but yes, I do have a feeling that such a procedure shouldn't have lasted for 87 days and shouldn't have been as difficult as it was for a company that could spend a billion of dollars to get rid of this local and limited problem with serious regional consequences. Next time, BP - if it is allowed to survive - may want to think about petroleum rather than beyond petroleum. But at any rate, it's good to see that the problem is most likely solved, a fine gift of BP to my name day today, and even if the problem reappears, it should be easier to solve it again. Lawrence Solomon and Physics World found a pretty breathtaking statement by Rajendra Pachauri distributed on July 5th. 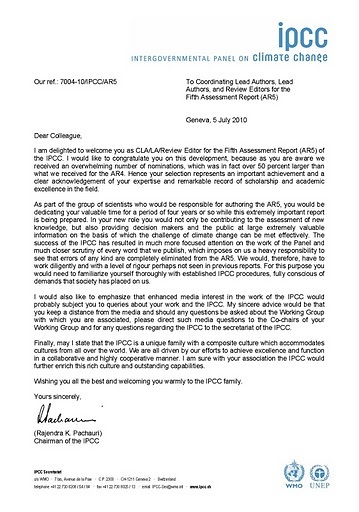 How did the IPCC chief, Rajendra Pachauri, implement these recommendations? In other words, whenever you want to open your mouth, you must ask the general secretaries and other political apparatchiks of the IPCC to open their mouths instead. Holy cow, what does this railway engineer think that he is? Another Saddam Hussein who is supposed to tell thousands of people whether they are allowed to speak and explain their work (and the answer is "No")? If he thinks he is another Saddam Hussein, it's OK with me, but he should also be treated in the same way. The beard shouldn't be enough to protect him. And yes, I do realize that Hussein was executed and the analogy I chose was no typo. The playlist has 25 entries or so. Click the tape in the left lower corner to choose another element of the playlist if one of them fails or if you find it boring. I've rearranged the original playlist so that it plays at the beginning. that are higgsed down from an SO(10) to the Pati-Salam SO(6) x SO(4) group. They draw lots of histograms that show the distribution of desirable qualitative "traits" among these models. When you multiply all the factors, you will find out that 0.32 ppm (parts per million) of the models have all the desirable qualitative traits. So even in this pretty realistic and promising subclass of the string vacua, it would surely be wrong to say that the observed qualitative properties are "almost generic". Marcel Vonk, a Dutch string theorist currently working in Lisbon, has won the sixth and final championship of the 2010 World Series in Poker on July 5th. That came with $570,960 in prize money which is about 1/2 of the Nobel prize (minus the positive feedbacks and the more eternal fame of the latter). Congratulations! His work about the transitions between Calabi-Yau topologies has been mentioned on this blog. 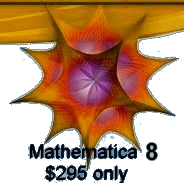 He's been also working on topological strings, NS5-brane partition sums, twistor-inspired rules in field theory, and type 0 old matrix models (or type 0 2D string theory). It seems almost unbelievable to me that - the always youthfully looking - Gerhard Schwarz has already turned 60 years old. 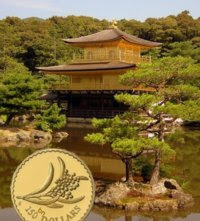 It is a nice and, to some extent, distinguished age in which the people of previous generations began to slow down their lives and recapitulate. However, these days, it is still the undepreciated middle age. In the case of Gerhard Schwarz, that's a good news because there is a huge shortage of the people of his type - especially in the current and highly illiberal Europe. And I expect lots of things from him in the future. A TRF reader who may be described as an achieved physicist and whose name can be found if you study the recent comments carefully has brought us some amazing details about the Higgs rumor at the Tevatron. On a completely different issue, I've heard that there's a rumor going around Aspen that the Tevatron will be announcing discovery of gluon + b → b + Higgs, which would then require large tan(beta), which would fit the MSSM. I guess we'll find out in a couple of weeks. At 5:50 pm, this rumor was confirmed to me in a private communication with a particle physicist who is even more famous and whose name will remain secret but if you omit "a" and "the", the titles of his newest 6 papers at SPIRES begin with ULGDSL (starting from the newest one). ;-) He is skeptical about the rumor but heard it, noting that the statistics is supported by 3 bottom-quark events. If this is true, it's much more accurate and much more juicy than Tommaso Dorigo's version of the same rumor! Your humble correspondent would also be likely to win a $10,000 bet with Jester at Resonaances (without losing $100), among other bets. But needless to say, the real value of the discovery would be priceless. Recent rumors about the associated production of Higgs boson with bottom quarks, despite their being denied by the Fermilab P.R. 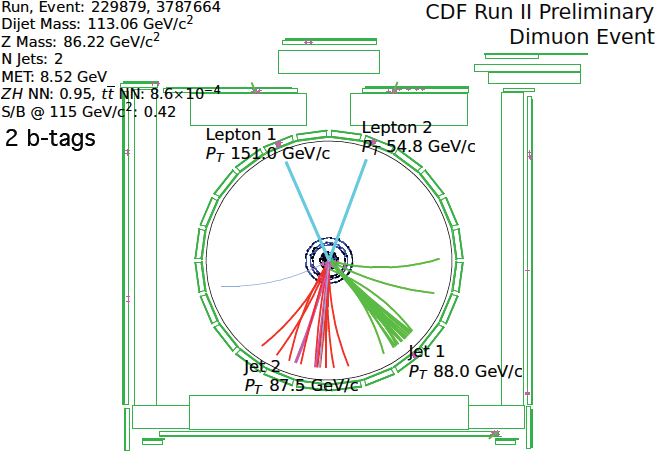 department, make it more likely than not that the Higgs boson is lighter than 135 GeV, possibly close to the 115 GeV figure suggested by CERN's previous LEP collider right before it was stopped by Luciano Maiani in 2000. Why the Higgs has to exist? It's often said that a left-wing fraudster, sexual poodle, and predator invented the Internet. Margaret Thatcher was more circumspect when she wrong-footed sceptical Cabinet colleagues with her defence of public spending on the Large Hadron Collider. "Yes, but isn't it interesting?" was enough to stifle their objections. And her interest in the work at CERN was rewarded by Tim Berners-Lee establishing the groundwork for the World Wide Web. I've seen the original computer server with a note from Tim attached, instructing fellow scientists not to switch it off. Our lives have truly been revolutionised by his inventiveness. These were still the times when the world kind of worked. Indeed, the LHC was and is damn interesting, the investments to CERN have already returned many times, and it was great that Margaret Thatcher could close the mouth of her less gifted colleagues so elegantly and easily. The 400 x 300 PNG image above has 225,173 bytes. 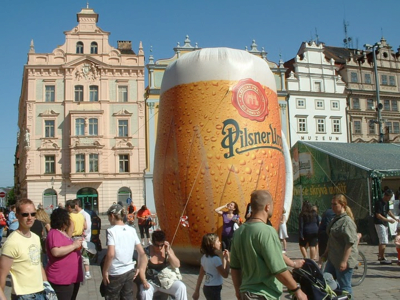 It seems to capture an innocent event at the center of Pilsen, Czechia. However, that's just an illusion! If you look at the picture above properly, carefully, and from another perspective, it's actually a 500 x 300 image with a detailed picture of the face of a very famous evil person who remains at large - and something that has made him or her famous. Updates: The rumor was initially denied by the Fermilab's spokespeople and spokesgirls. More importantly, a detailed Fermilab D0+CDF pre-ICHEP talk on July 16th, 11 pm Prague Summer Time, showed that all their separate measurements are compatible with the absence of any new physics as well as Higgs. String universality is the hypothesized principle that the string theoretical vacua may produce all low-energy effective field theories (except for a possible quantization of some parameters) that can't be proven inconsistent by some non-stringy techniques. If it is true, "string theory consistency" is the same thing as "consistency". String theory covers all possibilities that are worth covering - and it allows you to compute their physics without any limitations on energy or accuracy. This song from an Islamic satellite channel is kind of catchy. However, the content is disastrous. Most of these kids would obviously be able to do the same fun things as their Western counterparts; they are being converted to mindless killing machines instead. I find it obvious that whoever wants to improve the situation in the Middle East should pay exactly 0 attention to those adults who are educating the children in this way. The children sing that the situation has turned them into grownups; but that's only because their parents and other adults are at least as immature as these kids. Yesterday, I was trying to explain to Fabrizio Nesti at Tommaso Dorigo's blog why there can't be any "GraviGUT" symmetry, a hypothetical tool to unify gravity and other forces by extending the Yang-Mills group to a larger group that also contains the Lorentz group as a subgroup. This "unification" violates the Coleman-Mandula theorem, of course, but there are easier ways to see why this particular concept cannot be right. I will be talking about the SO(3,11) example although some other attempts may exist in the literature. People such as Fabrizio Nesti (a recent paper), Roberto Percacci (see his recent review), and also Garrett Lisi (explicitly in his newest surfer handbook), among others, have been trying to attack the problem of unification in similar ways. The discussion seemed hopeless but it's conceivable that at the end of the day, Fabrizio understood the simple points I was making. shows that the sea surface anomaly in the Niño 3.4 region was -0.6 °C (see page 5/30), which is below the -0.5 °C threshold that defines La Niña conditions. Last week, the number was exactly -0.5 °C. Just to remind you, the Milankovitch cycles are periodic astrophysical or orbital phenomena that were claimed by Milutin Milankovitch to explain the glaciation cycles - the ice ages and the interglacials. The idea is that these cycles change the amount of sunshine near the Arctic circle which was claimed by the Serbian scholar to be globally important. In particular, the axial tilt is changing between 22° and 24° or so with the periodicity of 41,000 years. The precession takes 26,000 years to be completed. The eccentricity variations take something like 100,000 years: recall that eccentricity measures how "non-circular" (elliptic) the Earth's orbit around the Sun is. And there are a few other, less important cycles with similar periodicities. The graphs above are just unimpressive. A lag of 8,000 years has to be added by hand to make it at least remotely plausible. There's no real agreement over there. The reconstructed ice volume - the white curve that is based on ice core data - is dominated by the slow cycles that take 100,000 years to be completed while the theoretically calculated insolation at 65 °N - the purple line claimed to be responsible for these changes of ice volume - is dominated by the faster cycles that only take 20,000 years or so to be completed. that mixes several goals. (GHE stands for "greenhouse effect.") It says that "nothing is changing" about the catastrophic man-made climate change; it is an elementary yet semi-technical introduction to the Earth's energy budget and the greenhouse effect; and it offers some cheap attacks against all ideas in the climate science that are not helpful to enhance the people's belief in the catastrophic man-made climate change. The nearly final temperature readings of UAH AMSU for June 2010 are out and the global temperature anomaly of 0.44 °C significantly - by 0.16 °C - differs from my estimates based on a different satellite which is used by the daily UAH data. So June 2010 was 0.13 °C cooler than June 1998 and it is the coolest month of 2010 so far. Also, the average anomaly of the first six months (H1) of 2010, 0.56 °C, is cooler than H1 of 1998, 0.64 °C, by 0.08 °C. Of course, if this temperature difference continued for H2 of 2010, 2010 would be cooler than 1998. In 1983, Czechoslovakia (and partly West Germany) shot The Visitors, a science-fiction series that I liked a lot - and so did many other Czechoslovak and German viewers. Click here for the 1st part; warning: DVD stability issues. The user has posted all episodes. In May 2484, the United Nations' top supercomputer, the Central Brain of Mankind (CBM, not to be confused with Commodore Business Machines) or CML in Czech, calculates that a comet will nearly collide with the Earth in half a year. The distorted orbit would lead to a catastrophic climate change. The United Nations employ a time machine (an enhanced SUV) to send a stealth expedition back to 1984 when a little boy, Adam Bernau, celebrates his 11th birthday. Yes, your humble correspondent was born in 1973. Adam Bernau would later win a physics Nobel prize. The science historians in 2484 believe that the fire in their house burned and destroyed Bernau's documents that describe a method how to easily move whole continents. (Adam actually tore the notebook apart before the fire, to impress his sweetheart.) This method could save life of billions of people and animals on Earth in 2484. Most TRF readers are Americans. So Happy Independence Day! As The Washington Post just announced, spectroscopic and chemical analyses of Jefferson's four-page "original Rough draught" have shown that the word originally written instead of "citizens" was "subjects". Richard Nixon was a Republican and he had to leave his office. But you can see that he's being worshiped by some environmentalists (and by Jon Stewart during a recent show about the failed energy-independence promises of the latest 8 U.S. presidents) as their patron. After all, it was him who founded the Environmental Protection Agency (EPA) and introduced many other green laws. And he has also endorsed the first Earth Day in 1970. Daniel Patrick Moynihan was a top Democrat, a Senator and the U.S. Ambassador to the U.N. and India. However, in the Nixon administration, he served as an influential advisor for Urban Affairs. Witten getting the Craaford Prize. IOP and the Dutch Academy can't offer any famous W. to give their medals to E.W. Edward Witten has received the 2010 Lorentz Medal from the Dutch Royal Academy and the 2010 Isaac Newton Medal from the British Institute of Physics; see Physics World. So Witten has delivered an IOP lecture in the U.K. Jim Al-Khalili, a twitter and Iraqi-born English broadcaster and theoretical physics professor (Wiki), usually watches Ghana as it plays soccer. Originally posted on July 1st in the morning. He was provoked by a talk by John Moffat who proposes a new adjective for the standard model of cosmology: it is "anti-Copernican", he claims. Why? Because we apparently live at a special time when the mass stored in the dark energy is comparable to the dark matter. That's "anti-Copernican" because there should be nothing special about us. Hans Bethe was born on July 2nd, 1906, in Strasbourg, Germany (now France). Penn State University is among top ten largest U.S. public schools. July 1st, 2010 will be remembered as a black day in its history. They claim that those 60 megabytes of proofs that Mr. Mann has not been an honest scientist essentially don't exist. When told that the first three allegations against Dr. Mann were dismissed at the inquiry stage of the RA-lO process, Dr. Lindzen's response was: "It's thoroughly amazing. I mean these are issues that he explicitly stated in the emails. I'm wondering what's going on?" Indeed, the "accusations" that he has been "cleared of" are exactly the points that have been explicitly described in the CRU e-mails, in some cases by Michael Mann himself. The event was organized by the Institute of International Finance. He starts by saying that he has no comparative advantages to discuss the global power shifts but he says quite a lot, anyway. Klaus divides the world to Europe, America, and BRIC - while other countries are subsumed in one of the three groups. Well, the playfulness of this title is probably over the edge. 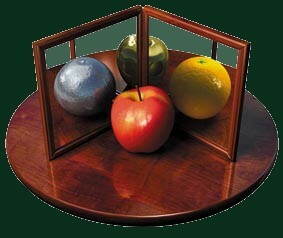 What I mean is that five-dimensional general relativity may refuse to accept Roger Penrose's cosmic censorship rules. In its attempts to censor the Internet, China is following the 1969 recipe by Roger Penrose. ;-) His Cosmic Censorship Conjecture (CCC) is somewhat vague but it says that general relativity will never evolve a generic initial state to a final state with naked singularities i.e. those singularities that are not hidden under a causally inaccessible event horizon. In this text, Mariana Ashley who "writes about online colleges" teaches us something about photosynthesis. In her opinion, CO2 is only as important for plants as ignorance. Photosynthesis is just politics, no science. She argues that the argument that "CO2 increases plants' growth" has "inherent weaknesses". Once you get to this remarkable sentence, you surely start to be curious what the weaknesses may be. Our new biology teacher will tell you what they are! Because June 2009 was relatively cool - with the anomaly of 0.05 °C - it means that the UAH anomaly for June 2010 will be around 0.60 °C which should still be enough to edge past 0.57 °C, the figure from the so-far warmest June, namely June 1998. However, the final UAH database is using different satellites than the daily data - with smaller diurnal errors - so the final reading may change by as much as 0.05 °C which would also invalidate the claim about the "new record". In 2009, the July anomaly was 0.39 °C higher than the June anomaly. Roy Spencer says that the final reading will probably be 0.44 °C, which is 0.16 °C lower than one calculated above. It's a huge change caused by the new satellite. The daily data are therefore unusable and my confidence in the satellite record has dropped markedly.